OKLAHOMA CITY – Today, House Speaker Jeffrey W. Hickman announced the chairs and vice chairs for the standing House committees and appropriation subcommittees of the 55th Oklahoma Legislature. OKLAHOMA CITY – Most of the 22 new lawmakers recently elected to the Oklahoma House of Representatives attended the first day of a two-day orientation session at the state Capitol on Monday to learn the ins and outs of the legislative process and meet the House staff. Freshman lawmakers were instructed on how to use the electronic filing system to file a bill and how to present a bill in committee and on the House floor. The House parliamentarian instructed lawmakers on how to make a motion and covered some of the most common procedural issues that arise. The lawmakers also met House staff and learned what each division’s duties are in the legislative process. Tomorrow, the new members will learn how the state budget is put together and will hear from representatives within the Oklahoma Ethics Commission to discuss relevant ethics rules. State Rep. Jeff Coody has a better understanding than most on what to expect. His mother, state Rep. Ann Coody, represents House District 64 at the Legislature. Still, he said the orientation exposed him to things that don’t often come up in conversations with his mother. Coody, an insurance agent from Lawton, was elected to House District 63 to replace former state Rep. Don Armes, who was term limited and unable to run for legislative office again. Oklahoma City college professor and businessman Jason Dunnington said the day-long orientation was helpful for new lawmakers who often have a very limited understanding of how the process of legislating actually works. Dunnington was elected to House District 88 and replaces former state Rep. Kay Floyd, who ran for and won a seat in the state Senate. Representatives Coody and Dunnington, and their new colleagues, still have much to do before the 2015 legislative session begins. The deadline for requesting bills is this Friday, December 12, and the deadline for filing bills is January 22, 2015. On Tuesday, January 6, the Legislature will meet for Organization Day, a Constitutionally required day for the Oklahoma House to meet, certify the members of the recently elected 55th Oklahoma Legislature and then officially nominate and vote on a new House Speaker and Speaker Pro-Tem for the upcoming legislative session that begins in February. The 55th Oklahoma Legislature convenes on February 2, 2015 at noon. OKLAHOMA CITY – Oklahoma House Speaker Jeff Hickman today announced several appointments to leadership positions, naming the majority floor leader, floor leaders and majority whip. Hickman named state Rep. Charles Ortega to serve as majority floor leader. Hickman said that Ortega brings a unique combination of organizational experience and temperament to an important job that helps steer the House agenda. “Every year, there are more than 2,000 bills and resolutions in the Legislature which must be considered,” said Hickman, R-Fairview. “It is absolutely vital that we operate not only efficiently, but also in a deliberative, thoughtful way which reflects the seriousness of what our constituents send us here to accomplish. I am confident that Rep. Ortega is the right person for this job. Ortega, who served as assistant majority floor leader during the 2014 legislative session, will be responsible for reviewing legislation and overseeing the process to determine which bills will be heard on the House floor. 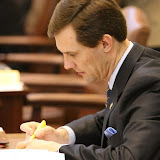 In addition, Hickman named state Reps. Jason Nelson and Lisa Billy, two highly respected members throughout the House, to serve as floor leaders. Nelson and Billy will be responsible for developing the calendar and directing floor activity, including the scheduling of bills and resolutions for votes on the floor. Finally, Hickman appointed state Rep. Gary Banz to serve as majority whip, responsible for assisting the floor leaders and for ensuring that votes are in place and members are in attendance. The whip also serves as a sounding board for members who may have concerns on upcoming legislation.